Starting in the 1920s, “1031 Exchanges” give real estate investors a way to recycle and preserve capital by deferring tax on gains from the sale of one property by promptly reinvesting it in another. Unfortunately, investors in operating companies have not had a similar vehicle to forestall the tax man. Until recently, that is. The passage of the Tax Cuts and Jobs Act of 2017 introduced the “Opportunity Zone” program. 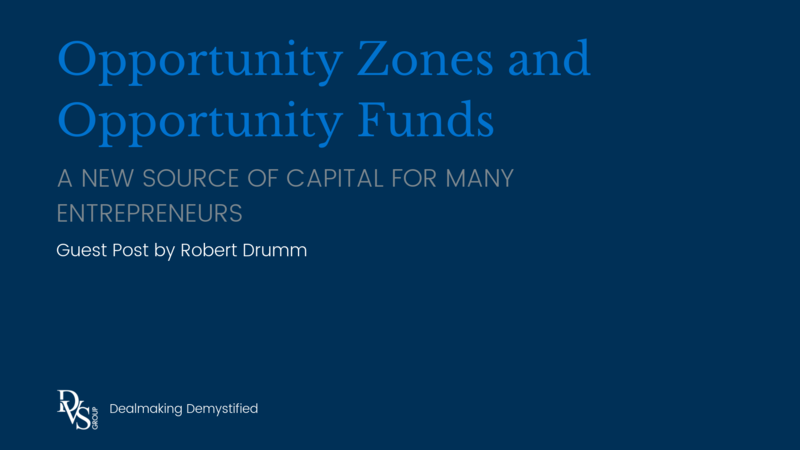 The “Opportunity Zone” program permits investors to defer taxes on capital gains if they reinvest those gains in a wider range of business assets located within qualified Opportunity Zones. The creation of Opportunity Zones makes it possible for the owners of operating businesses – not just real estate – to attract investment capital for their businesses if they are located within an Opportunity Zone, or if they can relocate their businesses to an Opportunity Zone. Opportunity Zones are specific low-income census tracts located in all fifty states (as well as tracts in overseas U.S. possessions like Guam, and the entire island of Puerto Rico). Each state’s governor nominated tracts for the Opportunity Zone program. From those nominations, the Department of the Treasury designated more than 8,700 tracts as Opportunity Zones. A review of the Opportunity Zone map shows that even in generally prosperous areas like Johnson County, Kansas, there are places to locate businesses that qualify for the program. Opportunity Zones encourage private investment in disadvantaged areas, and they create a new way for entrepreneurs who wish to buy or expand a business that ordinarily would be beyond their financial reach to attract long-term, patient capital. Investors can create or invest in Opportunity Funds, which are US partnerships or corporations (including LLC’s taxed as partnerships or corporations) that certify that they intend to invest at least 90% of their holdings in Opportunity Zones. Numerous private equity fund managers are setting up funds that will invest in multiple businesses, but an entrepreneur can set up a “fund” that is in fact a regular company that will invest in a single operating business or real estate project. The entrepreneur or other investors can then make an equity investment in the Opportunity Fund in an amount that is equal to (or less than) any gain that would otherwise be subject to tax within business property that is in an Opportunity Zone. Or, in the more likely scenario, the investors can make an investment in a qualified corporation stock or qualified partnership interests of a business that meets the Opportunity Zone criteria. Investors should review the detailed qualifications for the investment with an attorney or other advisor. Key among these are that the investor must acquire the actual business assets after 2017 from an unrelated seller, and if the assets are not new, they must be, in most cases, “substantially rehabilitated.” Also, the program excludes certain businesses such as golf courses, country clubs, massage parlors, tanning facilities, casinos, and liquor stores. There are a few ways Opportunity Zone investments are different than 1031 Exchanges. In 1031 Exchanges, investments must be the full “proceeds” of the previous transaction. In the Opportunity Zone program, investors can limit their investment to the amount of the gain. The deferral of gains in a 1031 is indefinite; in the Opportunity Zone program, it is time-limited. When using a 1031 Exchange, investments must be in “like-kind” property, i.e. real estate for real estate. Investments don’t have to be in “like-kind” property when in an Opportunity Zone. In a 1031 Exchange, investors must use an intermediary to hold and trace funds between the gain-producing sale and the new investment. Opportunity Zone investments don’t require an intermediary to trace funds. If the investor contributes the right amount to the fund within 180 days, the investment qualifies for the program. The tax advantage of investing in a qualified business through an Opportunity Fund is significant and, in many ways, goes far beyond the 1031 Exchange deferment. The fact that all gains achieved in the Opportunity Zone investment are excluded from tax if the investment is held for 10 years is key for the long-term investor, and it is key for the entrepreneur looking for that long-term investor. If the investor contributes $500,000 in capital gains to a project through an Opportunity Fund, he won’t owe capital gains tax on them until April 15, 2027 (for the 2026 tax year). If the investor sold that $500,000 investment on July 1, 2029 for $2 million, then no capital gains tax would ever be payable on the additional $1.5 million gain. In addition to being a great benefit for the investors, it also creates a tremendous opportunity for people who seek additional capital to buy or expand a small business. For example, Sally, a typical entrepreneur, is about to buy an electrical equipment distribution business. In gathering her equity stake, she liquidates $200,000 in marketable securities, realizing $100,000 in gains for her equity. Before she can buy the business, she must typically pay $15,000 to $20,000 of her stake to the tax man, but if she can locate her business within an Opportunity Zone and structure the investment properly, she would defer that tax bill until April 2027 and have the full $200,000 to put to work immediately. If she retained and grew the business over the next 10 years, then she would be entitled to exclude all the new capital gain from that business from taxes. As another example, Ted, another entrepreneur who could otherwise only deploy and leverage his own $200,000 in equity to buy a $1 million business on his own, might be connected to some investors with capital gains that need to be deferred and can—using the Opportunity Zone program—obtain additional funds from them to buy a business for $2 million or more. He gets a larger, more stable business to build upon, and investors get significant tax advantages. The complete rules and the practical steps to make use of the Opportunity Zone program are, of course, much more complicated than presented here. The IRS has only recently issued its initial guidance on Opportunity Zones. Any entrepreneurs who are starting or expanding a business that is (or could be) located in an Opportunity Zone would do well to explore the program with their attorneys and financial advisors, and see if it might further their business plans.